Less than 20 miles from the Capitol’s steps, through the buttoned-down section of the city and down a tree-lined parkway, sits a country club founded 87 years ago to give politicians and businessmen a place to loosen up and schmooze. And now with two wars, a tight economy and a high national unemployment rate, the prevailing belief is that constituents do not want to see their representatives having fun at the golf course. So, now they are going to discuss Obama right? Well, of course the answer is…….no. 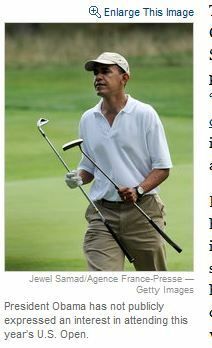 So far, I haven’t heard anyone complain about their Representatives of Senators playing golf. They do complain about Obama playing golf. Taking vacations. Holding and going to parties. Flying around the world. Stuffing his face with chili dogs. Which, let’s face it, is simply a way to attempt to make Obama look bad to the uniformed voters. Because, really, it would probably have been best for this country, and be best going forward to January 20, 2012, if Obama spent most of his time doing anything but pretending to Do President.